Now that we’re in the throes of spring here in New York City, let’s talk about greens. 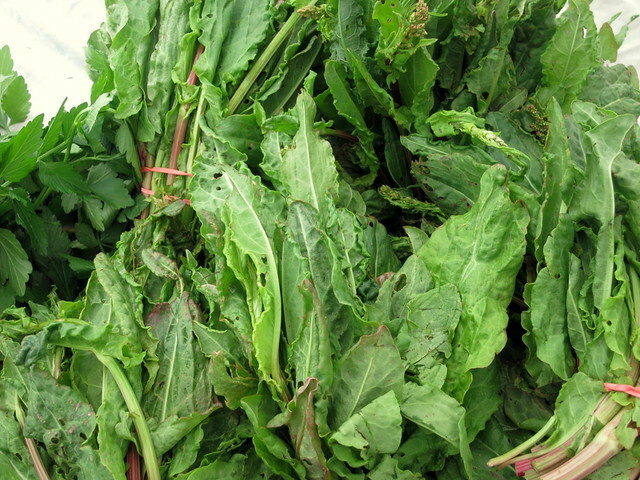 I adore greens of all kinds, whether they’re arugula, broccoli rabe or chickweed, to name a few. 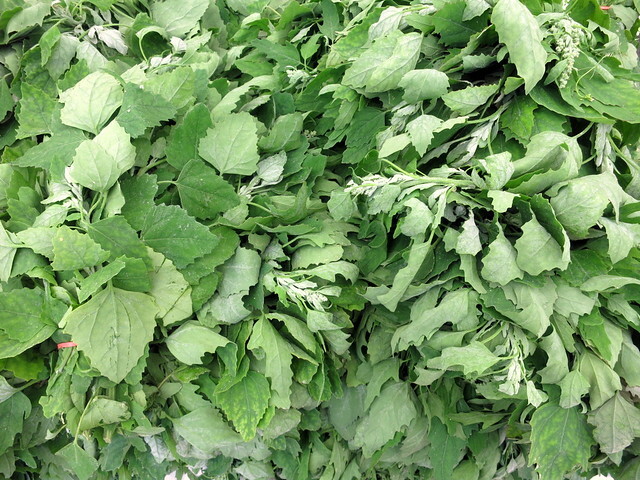 Arugula is such an underrated substitute for lettuce; try using it in salads or in pesto. 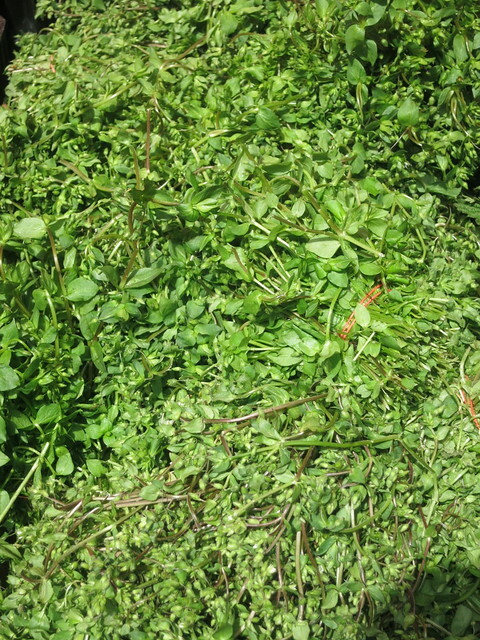 Chickweed has a crispness and a faintly grassy flavor that’s brightened with a vinaigrette of hazelnut oil and lemon juice. 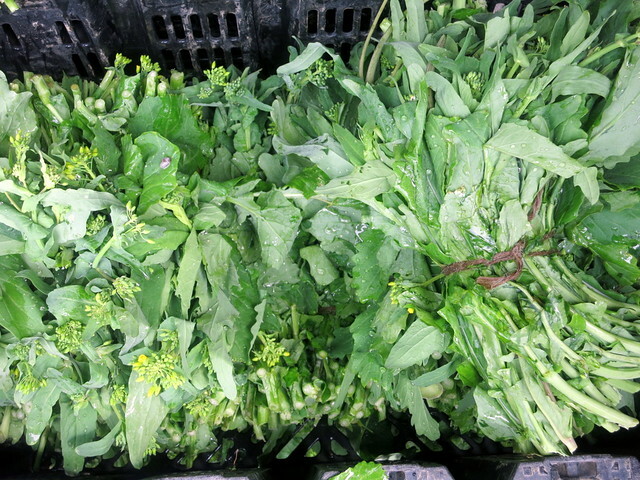 When subjected to long, slow cooking, broccoli rabe tames its bitterness and mellows out, becoming supple and temder. Better known as the vegetable that Popeye gobbles out of a can, spinach probably doesn’t appear on too many people’s favorite food lists. It’s clearly one of mine. I love that it has a silken butteriness that manifests whenever its cooked. 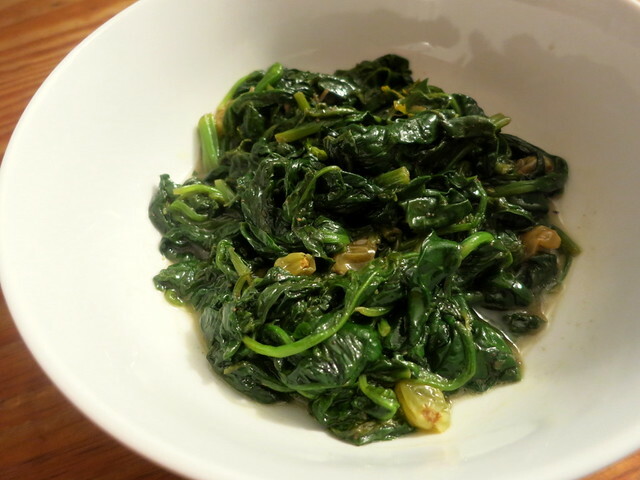 My standard treatment for spinach (or just about any spring green) is to simmer it in lightly salted water, then coarsely chop and sauté in oil along with garlic, anchovy and lemon. Oh sure, there are other recipes like spanakopita (spinach pie) and saag paneer (creamed spinach with Indian spices and cheese), but this method along with today’s offering are the dishes I return to the most often. Adapted from this recipe at Lidia’s Italy. 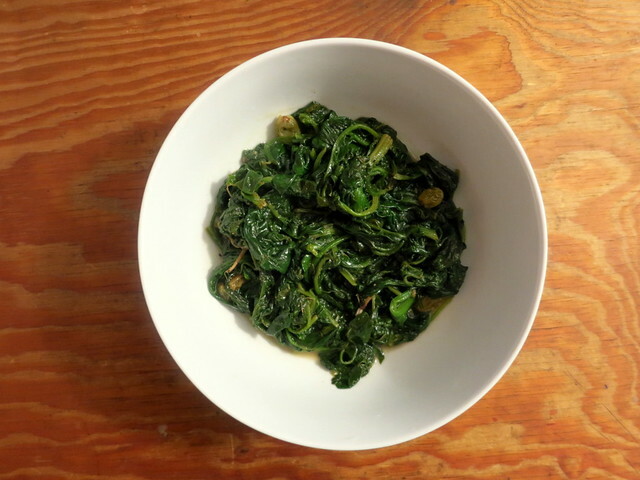 Spinaci alla Genovese is a classic Roman dish; Ligurians will oftentimes add anchovy. The combination of raisins and pine nuts in savory dishes is very Italian and dates from the Middle Ages when use of such ingredients was common. 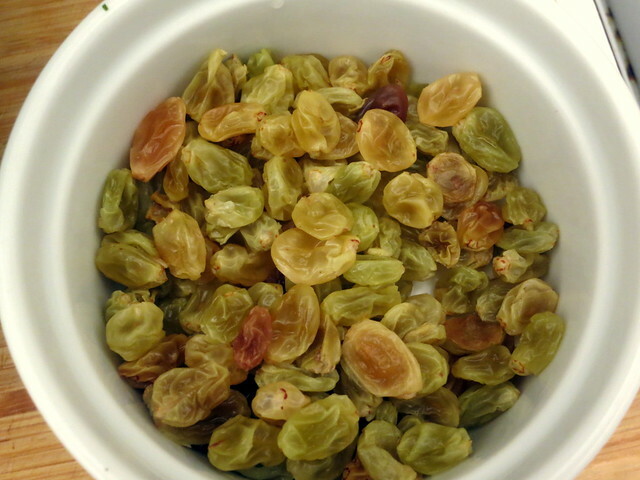 Occasionally, I will substitute dried currants for the raisins in the original recipe. I also omitted the pine nuts, but otherwise it’s as written. If you don’t have fresh nutmeg, ground nutmeg is fine. Although the original recipe instructs that the anchovies be chopped up, I have found success just by adding the whole fillets as pictured below. Bring 1/2 cup of water to a boil, then pour water into a small bowl. Add the raisins; soak until the raisins have plumped up and softened. Lift raisins out with a slotted spoon and place in a small bowl; reserve the soaking liquid. Wash and drain spinach just before you cook it. There should be droplets of water left clinging to the leaves. 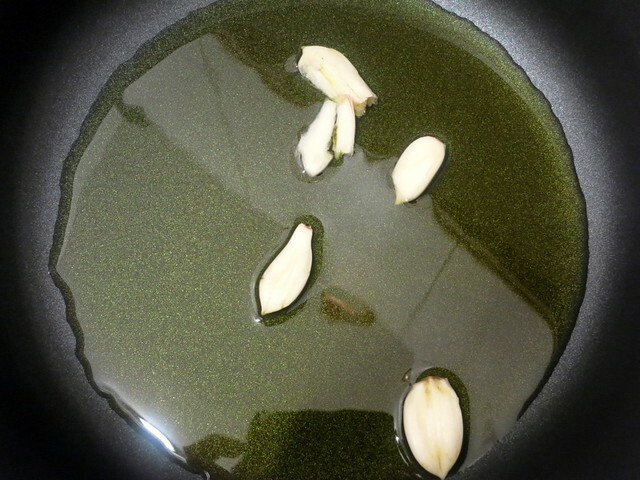 Pour the olive oil into the pan, set it over medium-high heat, and toss in the crushed garlic cloves. If you add the garlic cloves to the oil while it’s in the process of warming up, the garlic will infuse the oil with bit more flavor than if you had added the cloves to already heated oil. 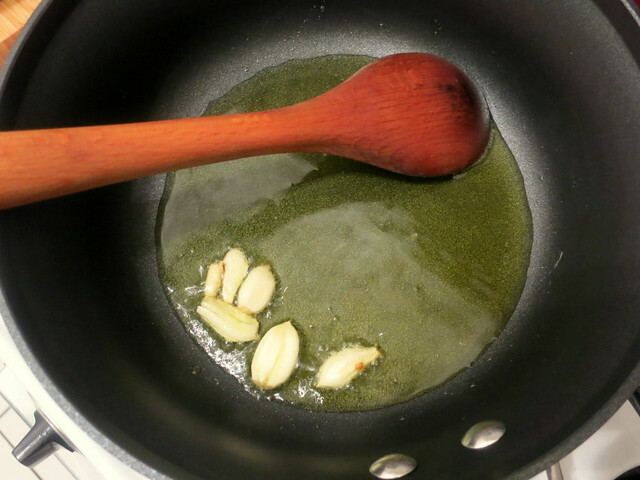 Cook and stir the garlic until it turns a pale gold, then drop in the anchovy fillets and cook, mashing them with the back of a wooden spoon for 1-2 minutes or until the fillets disintegrate and melt into the sauce. 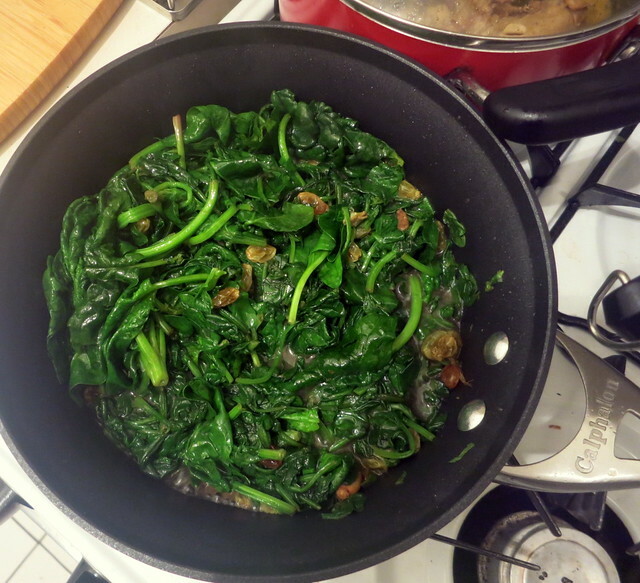 Fill the pan with spinach, heaping it in by the handfuls and letting it wilt down a bit before adding more. Once all the spinach is in the pan, scatter the raisins on top, and pour in any remaining soaking water. 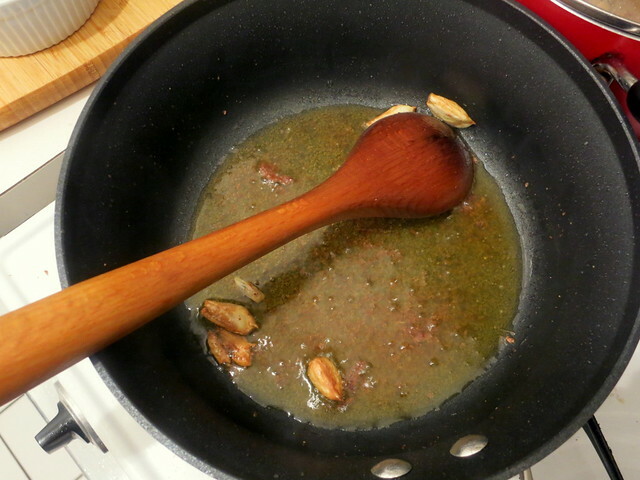 Sprinkle over them the salt and grated nutmeg. Toss the spinach leaves over and over with tongs, distributing the raisins and seasonings, then cover the pan and cook for a couple of minutes, until all the spinach has wilted and released its liquid. 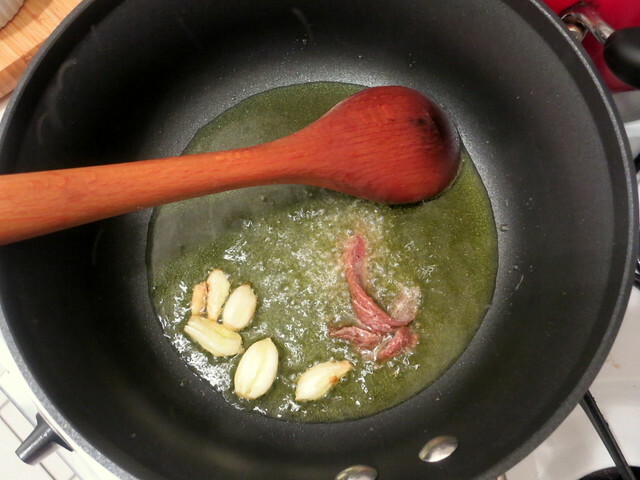 Remove the cover, and cook over high heat, stirring, tossing the spinach, and evaporating the liquid. Lidia recommends that you cook the spinach until the pan is dry but I prefer a little bit of sauce; either way is delicious. Taste for salt and pepper, then serve at once. This recipe is sized for 4 people. Time: About 30 minutes, not including prep. 18 May	This entry was published on May 18, 2014 at 11:57 am. It’s filed under cooking, food, food photography, Gluten-Free, Italian food, recipe, spring and tagged anchovy, food photography, gluten-free, Italian food, raisins, side dish, spinach, spring. Bookmark the permalink. Follow any comments here with the RSS feed for this post.